An anxious or stressed out dog or cat is cause for distress for any pet owner. Anxiety may come from depression or separation anxiety, or may also be due to the occurrence of unexpected, loud noises. Regardless of the cause, such disturbances can result in behavioral problems such as inappropriate urination, spraying, obsessive grooming, excessive scratching and other self-destructive actions. Worse, pets may become aggressive towards their owners, or they might hurt themselves in their fit of aggression. Amitriptyline is a prescription antidepressant that helps modify such behavioral problems and also lessens anxiety. The medication alters the brain's chemicals, adjusting the levels of serotonin and norepinephrine to a fine balance. Amitriptyline for pets is essentially the same medication that is prescribed for humans, albeit in smaller dosages. As with any prescription medication, it's best to consult with your veterinarian to formulate a plan of treatment specifically suited for your pet. Side effects do not generally occur, but may include weight gain (in cats), drowsiness, dry mouth (and other symptoms resulting from the drug's function as an antihistamine), loss of appetite, increased heart rate, urine retention, vomiting, and diarrhea. There may be an increase in excitability. Overdosing can have severe consequences for the heart, and should be treated immediately. 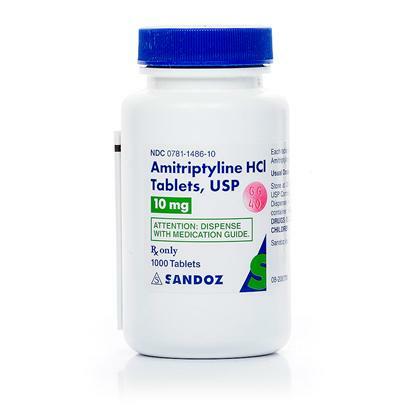 Amitriptyline can be administered either orally or by injection. Dosage is as prescribed by your veterinarian (generally, an oral dose is between 0.5 and 2 mg per pound once or twice a day for dogs, and between 2 and 10 mg per cat once daily for cats).